Automated Guided Vehicles, AGVs | KMH Systems, Inc.
Labor costs killing your bottom line? Did you know that labor accounts for 72% of lift truck ownership expenses? Automated guided vehicles crush your labor challenges by providing an affordable an effective transport solution—no overtime or growing labor rates. VGVs handle the repetitive delivery of goods, leaving the value-added work to their human coworkers. Optimize workflow processes and cut costs out of your operation with consistent and efficient delivery of goods. Automatic Guided Vehicles are one of the most dynamic areas in material handling today, but in fact, the basic concept is at least 50-years old. In recent years advances in electronics and software have resulted in significant improvements in the functionality of guided vehicles. With today’s microprocessor technology giving users vastly superior flexibility and capability, and cost effectiveness to previous generations of AGV systems. Automated Guided Vehicles (AGVs) can be the best horizontal transportation method for material handling in many applications. How do you know when an AGV System offers the best solution? 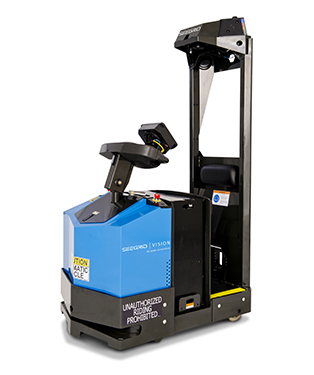 AGVS Systems are often used in conjunction with AS/RS machines, Automated Workcells, and Palletizers. In general, characteristics present in many successful AGS applications include medium, steady throughput, the desire to minimize fork truck traffic (and associated safety concerns as well), environments where flow is managed electronically, and flexibility. It goes without saying that long travel distances lend themselves well to AGV implementation. One popular way of controlling AGV Systems is laser guidance. Systems utilizing laser guidance provide unparalleled system flexibility. Vehicle guide paths can be altered, and pickup/drop-off points can added or eliminated quickly and easily. This is made simpler by the fact that laser-guided systems do not require the cost or hassle caused by drilling and/or cutting the floor while installing guidewire, magnets, or other passive targets…nor do they use less reliable methods such as adhesive guidance paths. The vehicle features laser scanner which provides navigation capability anywhere in the facility. The laser scanner strobes the plant, sensing reflective targets mounted progressively on the walls of the plant. As soon as two or more targets are located, the vehicle determines the vehicles’ current location using a triangulation algorithm in the control software. The software also runs additional calculations that determine the vehicle’s path to the next pick or drop location. Another popular methodology involves utilizing some floor-based markers…imbedded wire, tags, magnets, etc. These vehicles utilize more sophisticated on-board controllers, but don’t require and RF backbone or Overhead Antenna System. On-board controls allow each vehicle to perform their own traffic control, routing, remote dispatching and station functions. These systems are also user-configurable, within the limits of the predefined landmarks located in the floor. Other methods include GPS navigation, a less common but upcoming technology. Seegrid, the pioneer and leader in three-dimensional vision navigation, provides unique and revolutionary automation technology for materials handling. Engineered with state-of-the-art Seegrid Vision, industrial trucks are transformed into the next generation of AGVs: vision guided vehicles (VGVs). VGVs navigate without wires, lasers, magnets, or tape, and deliver unmatched flexibility. Designed for simplicity and reliability, the Seegrid flexible automation solution is offered in a line of pallet trucks and tow tractors. Experience the maximum benefits of VGVs with Seegrid Supervisor to manage, monitor, and control a fleet of vehicles in context of your operation. Generating economic advantages and operational efficiencies, VGVs optimize workflow processes, increase productivity and throughput, and reduce labor and operating costs. VGVs improve workplace safety, reduce equipment and product damage, and deliver a rapid return on investment. The vision guided vehicle (VGV) GP8 pallet truck uses Seegrid Vision to map its guidance within the existing environment. No infrastructure, facility modifications, or engineering resources are required for the VGV to operate. 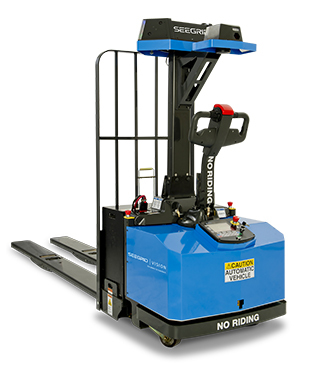 Position the GP8’s forks under the pallet(s), enter a programmed route on the keypad, and the vehicle reduces your materials handling cost per move by eliminating waste in labor resources typically used for non-value added transport. Ideal for applications such as putaway, long hauls, replenishment, staging/sortation, and cross docking, the VGV pallet truck improves worker and facility safety, reduces labor and operating costs, and reduces product, facility, and equipment damage, increasing productivity and profitability. The vision guided vehicle (VGV) GT10 tow tractor used with trailers, trains, carts, or dollies is an effective transport solution to support lean manufacturing, improving internal material flow. The GT10 eliminates waste in labor resources typically used for non-value added transport applications such as parts-to-line, end-of-line, and kitting. Seegrid’s vision guided tow tractor utilizes RideThruThenWork™ deployment with no infrastructure, facility modifications, or engineering resources required. The most simple, affordable, flexible automated tow tractor solution for moving product in manufacturing, as well as warehousing and distribution facilities. Seegrid Vision technology provides operators complete vehicle control to quickly modify or add routes without engineering support. Attach the load to the GT10 tow tractor, type in the route on the keypad, and the VGV is ready to transport. Seegrid Supervisor – Connect. Monitor. Control. 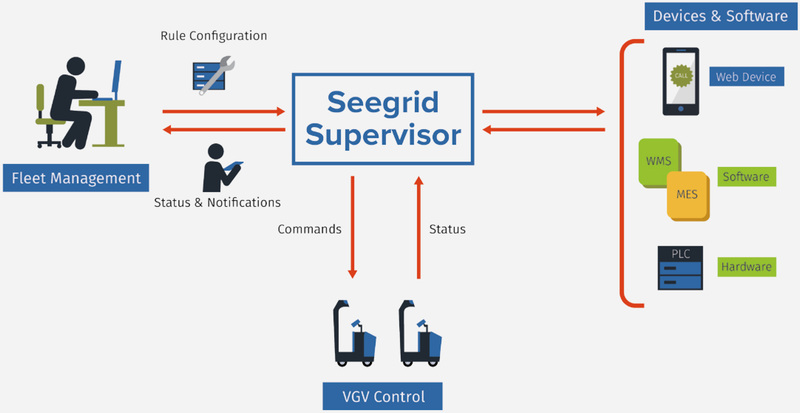 Guided by our philosophy of simplicity, affordability, and flexibility, Seegrid Supervisor connects, monitors, and controls vision guided vehicles (VGVs) within your operation. Seegrid Supervisor is a web application installed as a virtual machine, which communicates with VGVs over WiFi, and is configured through a local web browser. Three components provide visibility, control, and automation: Fleet Status, Intersection Manager, and Switchboard. Fleet Status delivers real-time monitoring of your Seegrid VGVs, providing live status and vehicle locations so you always know exactly where they are transporting goods within your operation. Intersection Manager acts as an automatic traffic cop for a fleet of Seegrid VGVs by receiving requests for access into common areas and granting or withholding access as traffic dictates, optimizing material flow and throughput. Switchboard provides a powerful and simple set of configurable rules to customize notification policies and commands, integrate with external control devices or software systems (WMS/MES), and dispatch VGVs for material transport.